Gov. Rosselló is flanked by cabinet members during the Tuesday news conference. Gov. 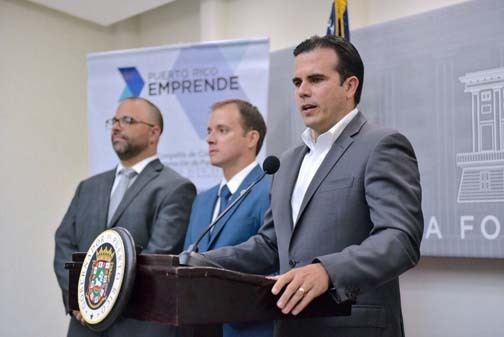 Ricardo Rosselló announced Tuesday the certification of 260 companies that are creating more than 1,000 jobs islandwide in the areas of sales, service and manufacturing. Rosselló made the announcement along with Economic Development and Commerce Secretary Manuel Laboy and Ricardo Llerandi, executive director of Puerto Rico Trade and Export Company. “Puerto Rico is ready for economic recovery. We’re betting on small businesses and new entrepreneurs to contribute to our island’s economic development,” Rosselló said. “Today, more than ever, the contribution and commitment of the private sector is crucial in creating new jobs,” he added during a news conference at La Fortaleza. Through the “Puerto Rico Emprende” platform, the government seeks to promote opportunities for the development of more local businesses so they can create jobs and be competitive locally and abroad. This platform includes incentive programs aimed at local small and mid-sized companies, the governor explained. The commitment to create 1,004 jobs is spurred by several laws and government programs aimed toward generating and retaining employees of small- and mid-sized companies, another providing incentives for young entrepreneurs, a community microenterprise program and an urban center direct employment program. “The new jobs we are announcing today span various sectors that impact Puerto Rico’s economy such as sales, installation and consulting of LED products, legal services, business consulting, microbreweries, creative food and pizza restaurants, and the sale of women’s clothing, among others,” Llerandi said. “This gives us a clear indication that more local entrepreneurs are betting on their innovative skills to turn them into business ideas, which in turn contribute to strengthening economic development,” he added, noting that 77 percent of the companies certified since January are run by entrepreneurs under 35. The Incentives for the Generation and Retention of Jobs in Small and Mid-Sized Businesses Act provides tax and wage incentives for small and medium enterprises to enable the sector’s development and expansion and create new jobs. This initiative is aimed at start-ups that are expanding and carry operating losses. To date, 14 companies have been certified through this program, to create 112 new jobs on or before six months after incentives are granted. Of those jobs, 88 will be from 11 new companies and 24 others from three expanding businesses. The Incentives and Financing for Young Entrepreneurs Act aims to streamline and facilitate the creation of new businesses by young people living in Puerto Rico. Among the benefits are: exemption from income tax, municipal license, property taxes, and an expedited licensing and certification process. Currently, 200 new companies have been certified through this program for a commitment to create 769 new jobs, administration officials said. In addition, the Community Microenterprise Program provides a financial incentive of up to $5,000 to existing community microbusinesses and start-ups. Through this program, 24 companies have been certified to create 36 new jobs. Meanwhile, the Direct Jobs at Urban Centers Program provides a wage subsidy to create up to 25 new jobs in companies established in an urban center while companies established outside the area can receive benefits to create up to 15 new jobs. Through this program, 21 companies have been certified, which will create 87 new jobs in three months. Hey Buddy!, I found this information for you: "Rosselló certifies 260 co.’s creating 1K jobs islandwide". Here is the website link: https://newsismybusiness.com/rossello-certifies-islandwide/. Thank you.